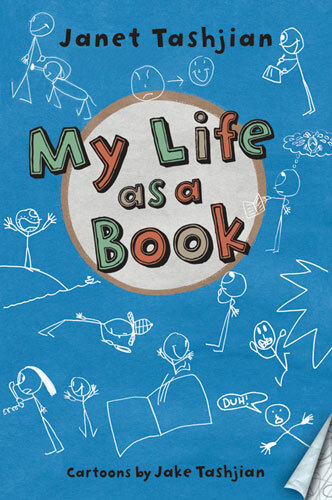 The Children's Book Club selection for May was My Life as a Book, by Janet Tashjian with cartoons by her son, Jake Tashjian. This story, set in modern-day California and Martha's Vineyard, tells the struggle that reluctant reader Derek has with completing his summer reading AND staying out of trouble. His antics include pelting avocados at the mail truck, playing with a trained monkey that is under his veterinarian mother's care, and generally trying to cause as much havoc as possible. It is only when Derek stumbles upon a faded newspaper article about a drowning in Martha's Vineyard a decade before that he becomes focused on a task: to find out the truth about the drowned teenager in the article. This quest leads Derek 3,000 miles from home and further away from completing his summer reading. Derek must decide which is more important. This book has been compared to the Diary of a Wimpy Kid series by Jeff Kinney. Although both are about mischievous boys and use cartoons, the Book Club felt that Kinney's books use the drawings to highlight the action and add to the story while Tashjian's drawings are more a method of explaining, in picture, some of the harder vocabulary words within the book. There was no group consensus on My Life as a Book. Some of the club members felt that this was a really interesting read, combining humor with mystery in order to create a unique reading experience. Other club members thought that the story jumped around too much to be truly enjoyable. June's Children's Book Club selection is Where the Mountain Meets the Moon by Grace Lin. This book was a Rhode Island Children's Book Award (Rooster Games) nominee for 2011 and is the Kids Reading Across Rhode Island book. (Grace Lin will be speaking on Saturday, May 14 at the RI State House) The Book Club is excited to read this fairy-tale adventure set in medieval China!